Acting Director Jeff Marootian helps plant the 2,000th tree of the 2017-2018 tree planting season. A little more than a month into the 2017-18 tree planting season and the District Department of Transportation (DDOT)’s Urban Forestry Division (UFD) has already planted more than 2,400 trees. The tree planting season runs from mid-fall through mid-spring, and DDOT aims to plant more than 8,000 trees during this planting season. 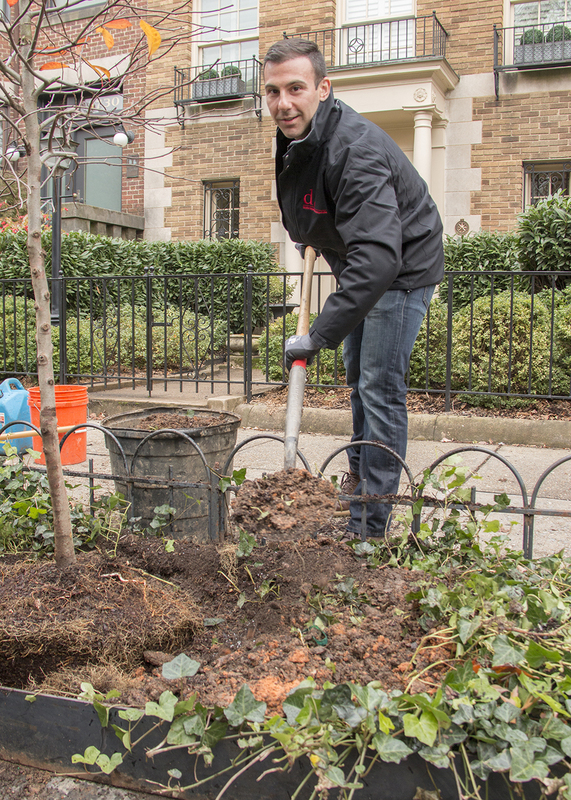 On Thursday, November 9, Acting Director Jeff Marootian and members of DDOT’s Urban Forestry Division planted a black gum (Nyssa sylvatica) tree on the 1700 block of S Street, NW. The newly planted tree is a native, disease- and pest-free species that was ablaze with vivid orange and red leaves. It is one of 272 trees of its species that DDOT will plant this planting season, as DDOT works to aggressively expand the District’s diverse tree canopy. The District has been routinely commended for its robust tree planting and maintenance efforts, including being recognized as a “Tree City USA community” by the Arbor Day Foundation. However, there’s still room for growth. At the agency’s 2017-2018 tree planting season kickoff Thursday, October 5, Acting Director Marootian announced DDOT aims to help grow the District’s tree canopy (currently at 38.7 percent) to 40 percent by 2020. DDOT is moving toward this ambitious goal at an impressive clip. The agency planted more than 8,000 trees for the first time ever in FY 2017, and aims to surpass this figure again in FY 2018. The District’s tree canopy is composed of about 130 tree species and cultivars. 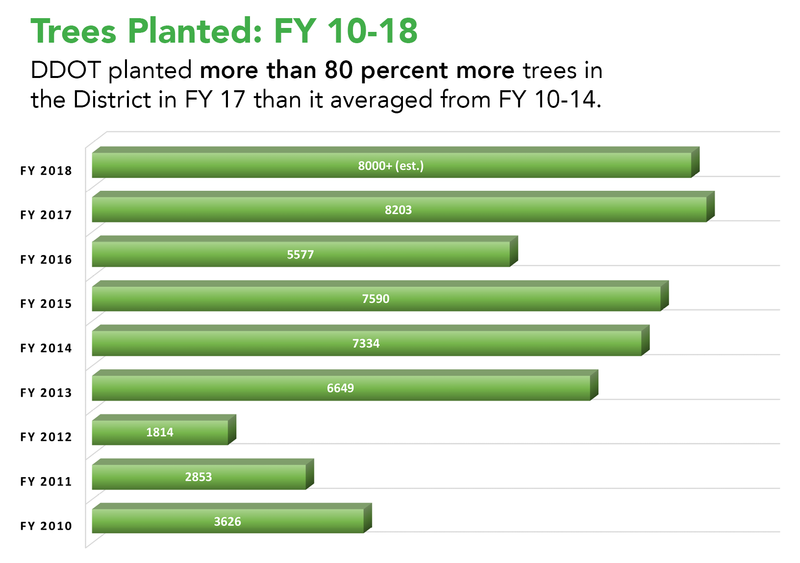 Click on the graph below to explore a detailed view of the species of the more than 8,000 trees DDOT has scheduled to plant during the 2017-2018 tree planting season. Click on the graph to explore a detailed view of the different species of the more than 8,000 trees DDOT has scheduled to plant during the 2017-2018 tree planting season. DC Tree Watering Application: Helps users locate trees in all eight wards that need watering, tag trees they water, upload photos, and report trees in need of care (for example, noting if a tree has a beehive). Tree Planting Map: Displays the work order numbers and species of all the trees scheduled for planting in the 2017-2018 tree planting season. Diverse Tree Canopy (Story Map): Provides details about the approximately 130 tree species and cultivars that DDOT plants in the District. This entry was posted in Environment, Public Space, Uncategorized and tagged DDOT, District Department of Transportation, District of Columbia, trees, UFD, Urban Forestry Division. Bookmark the permalink.